Nintendo has just released an attachment for the Wii remote that increases the sensitivity of motion recognition. The Wii Motion Plus device attaches to the bottom of the standard Wii remote, making the entire controller slightly longer. The added control will allow the Wii to detect the slightest wrist movement of the user. The upcoming Wii Sports Resort game will showcase this technology. The Motion Plus device is sold by itself for around $20 but comes bundled with the latest version of Tiger Woods PGA Tour golf (Tiger 10) which arrived at my house yesterday. I took it for a test drive last night in playing a round at Bethpage Black (site of the upcoming US Open next week). 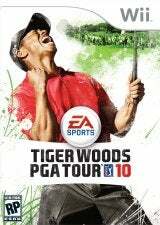 I've probably owned every single version of Tiger Woods golf since the series debuted in 1998. This version is very similar to the previous ones (no matter how much I try, in each version of the game the character I create looks like a creepy Herman Munster). I can definitely see the Motion Plus difference though. When I play on advanced (no post-contact spin, full control of your swing), I tend to turn my wrists too much at contact and the controller tilts resulting in a draw. I duck-hooked a few drives off the tee last night. This draw/hook feature was enabled in earlier versions of Tiger but now even the slightest mistake results in a draw or fade. The best part about the new game is the putting feature. You now can use precision putting which eliminates the need for cycling through multiple putters with different power levels. The sensitivity of Wii Motion Plus allows the Wii to detect your full putting motion and determine the pacing to assess how hard you're hitting the ball. It actually feels like real putting. In fact I actually found I have better success by looking at the ground during my swing after lining up the putt on the screen. Just as in a real putt in golf, I keep my head down and move my remote in the same method I would a real putter. It really does translate into similar results in the game. I had a 15 foot birdie putt that broke slightly and I just aimed it up looked down made a short/medium putting motion and heard the ball go in for birdie. With instant reply enabled you can go back and see what you missed during the putt. It is without a doubt the most realistic putting simulation I've ever experienced. Another Wii Motion Plus addition to Tiger Woods 10 is Disc Golf. Yes, this is that goofy sport that hippies like to play in the woods using frisbies and caged baskets on a pole. I would never play the real "sport" but on the Wii it is very cool. You have to have your wrist angle perfect to throw the frisbee far and straight. I played for a few holes last night and found it to be pretty realistic and entertaining. I'm pretty sure Josh will enjoy this side game. If you own a Wii, I do recommending getting Motion Plus at some point. I believe the device is bundled with Wii Sports Resort as well which comes out next month. I may buy that game just to get another Motion Plus device for a second remote (the Archery demo I've seen looks pretty awesome). Yeah it is all very phallic. That's the zing I was going for in the post title.